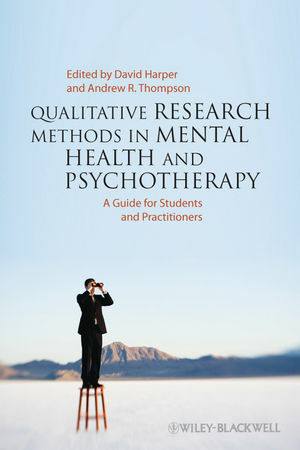 This book provides a user-friendly introduction to the qualitative methods most commonly used in the mental health and psychotherapy arena. David Harper is Reader in Clinical Psychology at the University of East London. He is co-author of Deconstructing Psychopathology (1995) and Psychology & Mental Health: From Disorder to Experience (2011). His research focuses on critical psychology and social constructionist approaches in mental health. Andrew R. Thompson is Senior Lecturer in Clinical Psychology and Director of Research Training, at the NHS Clinical Psychology Training Unit, University of Sheffield. He is also Clinical Health Psychologist at the Rotherham NHS Foundation Trust and a practitioner of Cognitive Analytic Therapy. 1 Introduction (Andrew R. Thompson and David Harper). 2 Identifying and Synthesizing Qualitative Literature (Rachel L. Shaw). 3 Ethical Issues in Qualitative Mental Health Research (Andrew R. Thompson and Eleni Chambers). 4 Participation and Service User Involvement (Alison Faulkner). 5 Qualitative Data Collection: Asking the Right Questions (Hannah Frith and Kate Gleeson). 6 Qualitative Methods for Studying Psychotherapy Change Processes (Robert Elliott). 7 Choosing a Qualitative Research Method (David Harper). 8 Interpretative Phenomenological Analysis in Mental Health and Psychotherapy Research (Michael Larkin and Andrew R. Thompson). 9 Existentialist-Informed Hermeneutic Phenomenology (Carla Willig and Abigail Billin). 10 Grounded Theory Methods for Mental Health Practitioners (Alison Tweed and Kathy Charmaz). 11 Discourse Analysis (Eugenie Georgaca and Evrinomy Avdi). 12 Narrative Psychology (Michael Murray and Sally Sargeant). 13 Ethnomethodology/Conversation Analysis (Mark Rapley). 14 Q Methodological Research in Mental Health and Psychotherapy (Wendy Stainton Rogers and Phillip O. Dyson). 15 Thematic Analysis (Helene Joffe). PART III Establishing Good Quality Qualitative Research in Mental Health. 16 In Pursuit of Quality (Liz Spencer and Jane Ritchie). 17 Emerging Issues and Future Directions (David Harper and Andrew R. Thompson).